Dimensions 76 inches H. x 104 inches W.
Overall Condition Poor. Most ofour pieces have spent decades on at least two continents, and have been treasured by several owners. Small splits, scrapes and cracks are a normal part of their patina attesting to their age and extensive use. We examine each piece carefully when we receive it and report any damage we find in our listings. Please look carefully at the pictures which may also reveal condition and damage. We do not recommend laundering textiles, and do not accept returns of textiles which have been laundered in any manner. Even dry cleaning is too much for some of these antique textiles. For some of them, a very gentle HAND washing (NEVER MACHINE, on any setting) in cool water with a very gentle detergent works, but even then, dyes may not be colorfast, and fabric may be less strong than it appears. 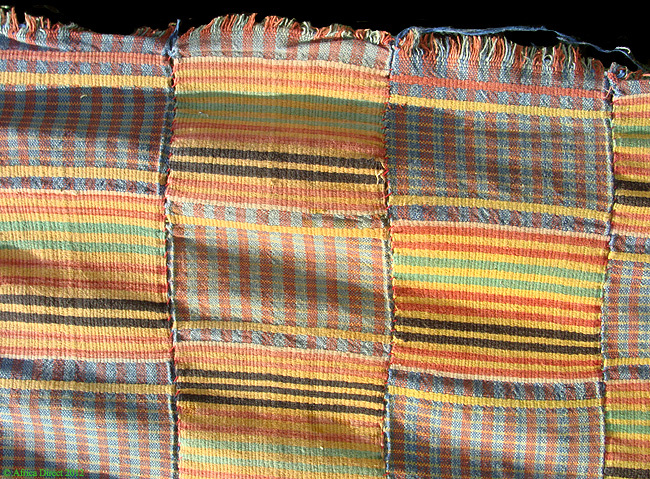 Additional Information: An old and well used handwoven cotton and cloth with strips hand-sewn together. 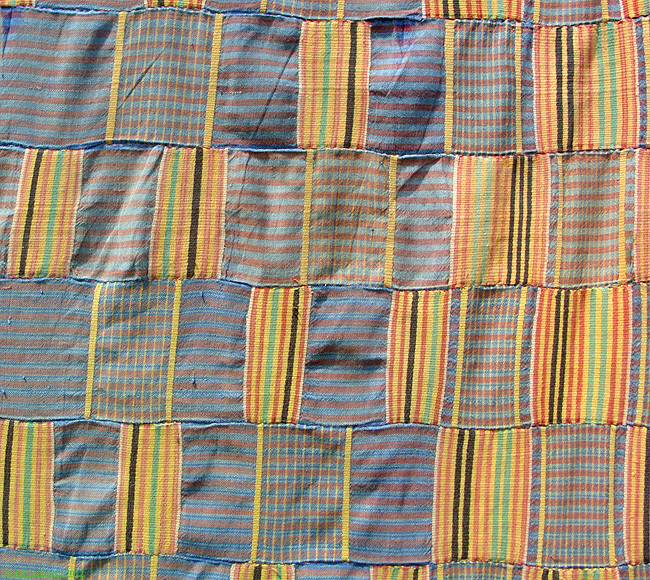 This is an Ewe Textile called "Keta" because such textiles were originally produced in a coastal town of that name. The Ewe occupy parts of both Ghana and Togo, separated by the Volta River, and the arts and rituals of these groups are quite different. The Ewe who live in Ghana use small carved wooden dolls for fertility purposes, similar to those of their larger neighbors, the Asante. They use pairs of small figures representing twins in a similar fashion to those of the Yoruba. The total output of the Ewe is limited to these few forms, most of which could have possibly been borrowed from neighbors. 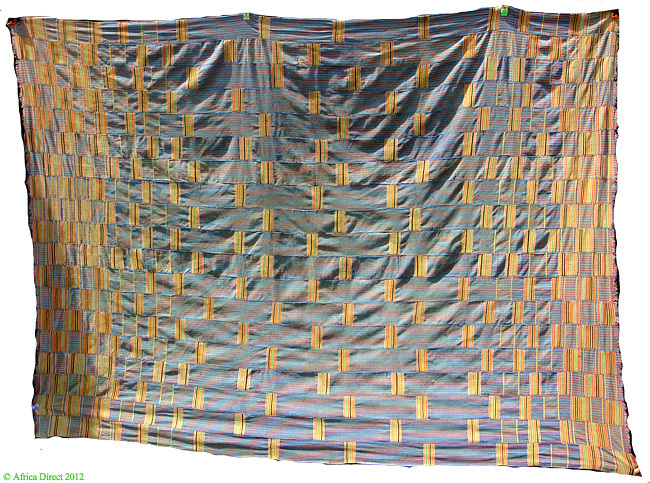 In addition to the ubiquitous small sculptures, the Ewe weave glorious and complex textiles, known as "keta," which are made of long cotton strips that are then sewn together. Though they are similar to the Kente of the Asante, there are distinguishing charactersitics which can be discerned by experts. 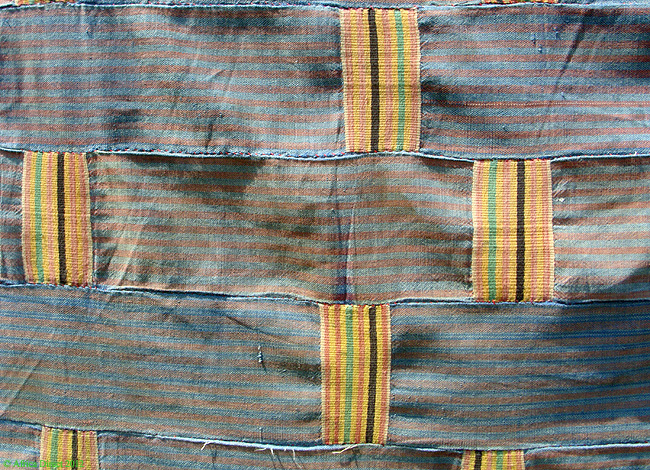 There are those who think the beauty of the keta exceeds that of the kente, and undoubtedly the subject still arises as the two cultures mingle together in Ghana today.The present example is from the first half of the 20th century and a example of old techniques of weaving in West Africa. The Ewe origin can be traced back to the region of "Ketu," which was Yoruba territory during the 14th century, in what is now the Republic of Benin. The aggressive Youruba eventually pushed the Ewe into a westward migration, and they ended up roughly where they are today, mostly in Ghana and Togo. Though the majority of cultures in this region choose leaders based on their mother's lineage, the Ewe appoint chief and attendants using male ancestors as their guides. Recommended Reading: See AFRICAN TEXTILES by Christopher Spring, and AFRICAN MAJESTY-THE TEXTILE ART OF THE ASHANTE AND EWE, by Adler and Barnard. I have examined this piece and agree with the description.